I'm happily back into my bread routine again. It didn't take much to kick start me into getting serious about it. The only shop breads I like now are the caraway seed rye from the German Bakehouse at $6.50 a loaf and their 100 percent rye which I think is about the same price. All the others are either tasteless or contain artificial additives and preservatives. The only way for me to get good bread for a good price is to make it myself. I already had my flours, yeast, recipe and equipment, I just had to reorganise my thinking to streamline making, cutting and storing the bread. The secret to successful baking in the long term is to make it as easy as you can so that you've always got bread on hand and it doesn't take too much time making it. 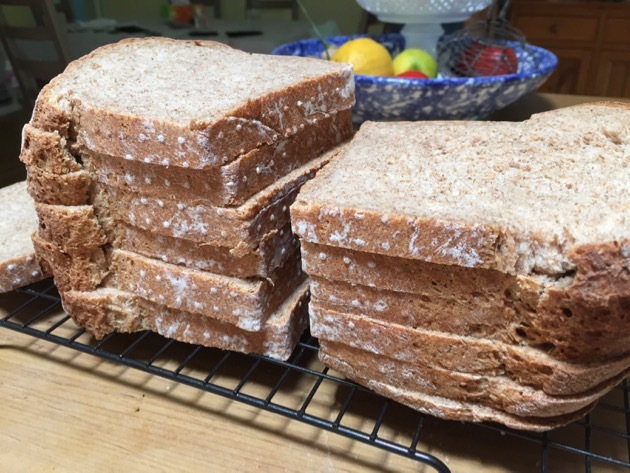 But after a decade of baking bread for my family every day, two things happened that made me rethink what I was doing: we started eating our main meal at lunchtime, and that reduced the amount of bread we needed, and I started writing another book and I had much less time. So when I came back to regular baking, it wasn't a daily task and I had to make sure a loaf remained appetising for two to three days. The bread above is a rye and spelt loaf. It costs between $2 and $3 to home produce it and the work involved in each loaf takes about 20 minutes. That includes loading the bread machine, kneading the dough, shaping, baking in the oven and slicing the loaf. I use a Sunbeam bread maker and Sunbeam slicer and would recommend them to anyone who wants to set themselves up as a home baker. You don't have to buy new, it doesn't have to be any particular brand; look around for clean secondhand. Or do what I did, start off making it by hand and add appliances if you want to and when you can afford it. I'm using the same bread recipe as always, I just change the type of flour every so often to get a different taste. I love this loaf, it's 50 percent organic rye and 50 percent organic spelt so it comes out quite soft, with a good flavour and texture which is ideal for sandwiches or for toast. During the hot and humid weather it stores quite well for three or four days in the fridge but with Jamie here, we go through a loaf in about two days. On the morning I need to bake, I activate two teaspoons of yeast in one teaspoon of sugar and warm water in a tea cup, then load the bread machine with the yeast, four cups of flour, 2 teaspoons of salt and enough water to make a slightly moist dough. I use the machine's dough cycle to mix the dough. All that takes five minutes. When the cycle finishes 90 minutes later, I take the dough out, knead it for a minute, shape it, place it in a bread tin and let it sit until it rises. That takes another five minutes. I keep an eye on the dough because I don't want it to over-rise, it's usually ready to bake in about 15 - 20 minutes. Ten minutes after the bread starts that second rise (the first one was in the bread machine) I turn the oven on to 220C to preheat. Having a hot oven helps the dough rise more in the oven, which gives the loaf a good texture. When the dough has risen enough but not too much, I place it carefully in the oven and turn the temperature down to 200C. About 20 - 25 minutes later, when I see the bread is golden brown and smell the aroma of baked bread, I take it out of the oven and leave the bread, in the tin, sitting on a cooling rack. About 30 minutes later, I remove the bread from the tin and allow it to cool completely on the rack. Doing that takes about a minute. 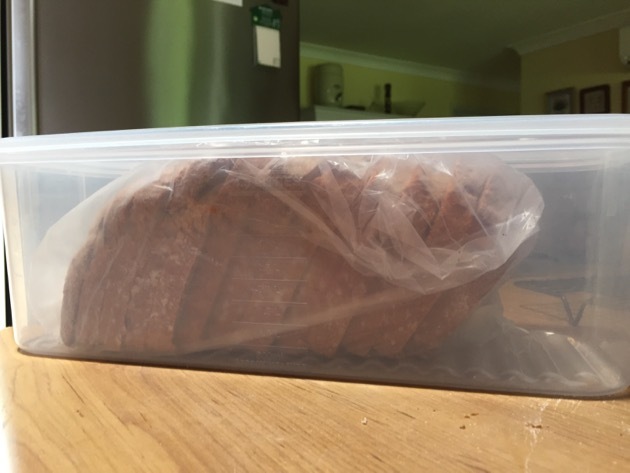 When the bread is cold, I slice it with my slicer, place the cut loaf in a plastic bag - to keep the slices together, and place the sliced loaf in a plastic box with a lid and store it in the fridge. Another five minutes. The bread is now ready to eat. The entire process took about 3½ hours but I was actively working on the loaf for less than 20 minutes. That 20 minutes gives us fresh, healthy, sliced bread. If you want to start making bread at home, do a little planning and research first to make is as easy as it can be. Find a reliable supplier of fresh flour, either online or close by, find a recipe you want to use that is tried and true. Set up your baking supplies so you've got everything you need and then start working on making the best loaf you can. You probably won't do that the first time you bake, but it won't take long. Work out what you like and don't like about each loaf and improve your method every time you bake. If this is something you want to do every day, or at least a few times a week, work out short cuts, experiment until you're baking the best bread you're capable of, and then develop your routine around it. 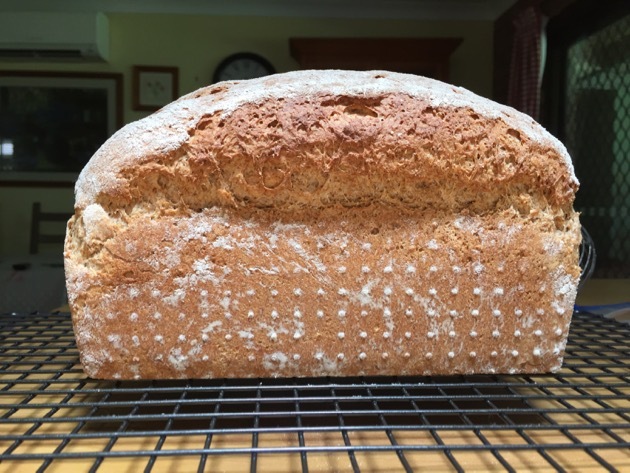 Being able to produce good bread consistently is significant skill that will stand you in good stead, increase your confidence as a cook and help you provide healthy food for your family at a price you can afford. I so agree with you, making bread at home is so economical, and it's very easy with a breadmaker. I bought a Sunbeam breadmaker second hand, very clean, and in perfect condition for 24.00. I use it all the time to make bread, it does all the work, and I bake it in my oven. I bake it in the bread maker if I am pinched for time, I just like the loafs from my pan better. great advise!! I was told to stop eating wheat because of arthritis but I found it was actually better when I stopped dairy,, I would have a hard time giving up wheat, bread is a staple food here! but to save my hands I use the trusty bread machine, what a great invention! I would love to try this when I get home from work today Rhonda, does it matter what flour you use, and how much water do you need? You can use any type of bread flour, Jan. All flours are different but a general rule to follow is to start with half the number of cups of flour you used. So for this recipe we're using 4 cups of flour, so start with 2 cups of water. Pour in about 1 ½ cups and then add the rest in small portions until the dough is right. If you're in Australia and you've got humid weather, you'll use less water and if you're in a colder place, you'll use a bit more. Good luck. Thanks Rhonda, I will let you know how it goes. Hi Rhonda, I have made two loaves so far, the first one I forgot about and left it in the bread machine for way too long and I thought I had ruined it but it turned out OK. The texture was really good, but it did not rise as much as I thought it should. I didn't worry too much as I thought that it was my fault and so I made a second loaf which rose beautifully the second time around but didn't rise any more in the oven and looked nothing like your lovely loaf despite following your temperature instructions. Could the bread tin I am using be too big? I bake my bread right in the machine and it is almost no effort at all to keep fresh bread on hand. It does take some patience and adjustments to learn to make good bread right in the machine but is worth it to me. I invested in a Zojirushi machine several years ago and have not regretted the cost of the machine. Now I just need the cute polka dots! Thanks for the tip about a sunbeam slicer. I need to buy one and to source good tins for bread baking. 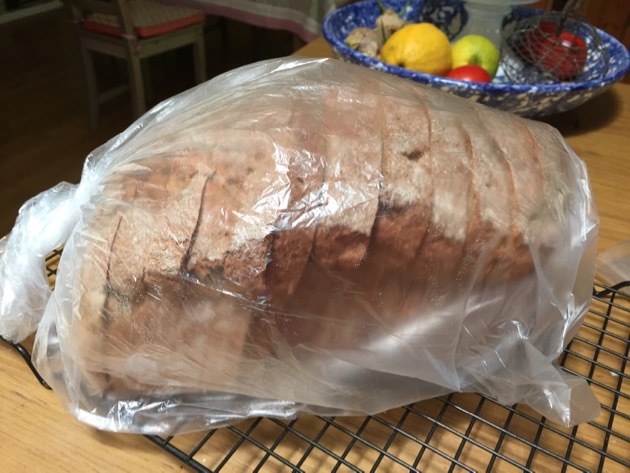 I will move to baking the bread in the oven now I have a thermomix and have given my bread maker to dear friends to help them on beginning their simple living tasks. They made their very first loaf last night I believe! :) Completely awesome! I've found a new spelt recipe, Rhonda - less ingredients and much tastier than the one I made last week. I added a mix of flax seeds, sesame seeds, pumpkin seeds and sunflower seeds as well. Also went and bought bread tins to finish the process in the oven and not the breadmaker; makes a far more sensible shape and slice size. I wrapped the loaf in a tea towel overnight on the kitchen counter and it sliced beautifully the next morning. As there's only two of us I froze it in 4-slice packages for use during the week. I always use rye to make sour dough loaves but will use it half/half with the spelt next week for something different - will also add caraway, YUM! Thanks! Beautiful bread! I, too, bake my own bread, two loaves at a time. One to eat fresh and the other to freeze. Since my husband and I are toast fiends, the thawed loaf is just fine for us. As gluten free (working toward wheat free but soaked other grains) people, I am still trying out the best mix of flours to get yummy soft bread that suits our tummies. I know you have an overnight recipe here on the blog, however if I was to use the above recipe I assume I would leave it in the fridge overnight for the first rise? I believe I had a little lemon juice to ensure the dough ferments a smidgen to help us digest. This is of course for our tummies, which are not diagnosed as celiac just sensitive! I have a wonderful spelt roll recipe that rises overnight in the fridge, they were delicious. The second rise is then done while the dough comes back up to room temp. Hi Ayesha, yes overnight in the fridge is like soaking the grains and it would be better for your sensitive tummies. You might need to tweak the recipe if it's not right the first time but I think it might suit you if you persevere. Good luck love. Thank you for buying the book and good luck with your thesis. How exciting! Your bread looks good enough to eat! ;) I, too, love making bread for my family, knowing that it is free of scary ingredients. The simple act of making bread is a wonderful way of blessing those around you. Your simple blog blessed the lives of many in the same way. Wishing you a wonderful 2016.
and all the good bread shops were disappearing as a result. Yes, the bread at the grocery store is outrageously priced for anything other than the white bread. The tasty breads are so spendy. Your bread always looks so beautiful! It took me a couple years, but I've finally got two breads in regular rotation here - no knead sourdough and braided bread. I'd love to learn how to make a good European rye bread next. I too bake a lot of our bread and buns. I don't like the 'mess' in my kitchen every few days so when I get the flours out I always make 3 to 5 loafs at a time. I only bake 1 loaf. The others I take and shape and FREEZE. Then later I just have a frozen loaf in the freezer to use. You can buy frozen loafs in the store for a pretty penny, so I figure I save about $2.75 for each loaf I make. I also make our buns. Here a package of 8 small burger or hot dogs buns cost over $2.00 for store brand. That is just nuts. I can shape dough to make buns for a lot less. Our favorite loaf is a peasant loaf. Just flour, yeast, salt, and water. It cooks un-shaped in my cast iron skillet with a lid. This makes wonderful toast and bread for a grilled cheese sandwich. I loved your comment Roxie and I think it would be time well spent to sit a while and watch you work in your kitchen. Coming from you; I consider it high praise. Funny, how something as simple as making bread can make a person happy and feel good. I know when I bake bread or anything else for that matter for my family I feel a sense of pride and satisfaction knowing what is IN the product and that MY hands made it for someone I love. Rhonda, I wanted to ask if you could share a little more about fresh bread storage? Plastic bags vs. cloth, refrigerating vs. leaving at room temp....? Thanks! Hi Jaime, it changes with the season. If I were to leave a loaf of bread out on the bench in a calico bag now, it would be mouldy in 2 -3 days. But I could easily do that in the cooler months here. I have an enamel bread bin and when it's cooler, I store bread in that bread bin in a calico bag. During summer, it needs more than that, it needs to be in the fridge. I put it in plastic in the fridge otherwise the bread dies out too much. I just have to remember to get the loaf out of the fridge a while before we eat it because we don't like eating cold bread. So just leave it at room temperature in a calico or plastic bag most of the time but as soon as it starts getting humid, it will need to be in plastic in the fridge. Thank you Rhonda. This is a really thorough 'how to do it' recipe. I go through spells of bread making, generally using the machine to start the dough off. I bought it a couple of years ago second hand, hardly used, for $10. The man who sold me the bread machine said it belonged to his 92 year old mother, he had brought it for her as a present but couldn't understand why she never used it ! Either way, I told him it would go to a good home. And for $10 I snatched it out of his hand before he changed his mind. Best $10 I've ever spent and I bet his mother thanked me, now he would have to stop nagging her to bake bread and she could put her feet up at last. I've been making our bread rolls for quite a while now, with good success. I have just been given a sourdough starter and have been playing with loaves and rolls. It is a much more time consuming process which takes planning - first to prepare the starter, then prepare the dough for a 4-10 hour first rise then a further 1 hour second rise and then baking. The flavour is the best gift, hubby has been raving about it! I know need to work on hydration levels to achieve a holier loaf. Its all good fun! We hardly eat any bread here so I started making much smaller loaves which get eaten up before they go mouldy. If there is a little left and I know it not going to be eaten I make into bread crumbs and freeze those. Like you I haven't bought bread for years and it is so tasteless unless you are prepared to pay a lot for a really good loaf. Hi :) I was hoping for advice on tins. I have a regular loaf tin as well as a long bread tin but my bread seems narrow and the slices more like a cake size than a slice of bread. Even with rising it just isn't high. Any suggestions? It sounds like your dough isn't kneaded enough to rise properly. You need baker's flour, not plain flour, and fresh yeast. If you're kneading by hand you have to knead for ten minutes. If that doesn't work, buy some bread improver from the supermarket and use it according to the directions. Make sure you allow the bread to rise twice before baking and use the regular loaf tin. Good luck. Hi Rhonda. Love this post and I do make buns but just wondering with your beautiful loaves...what type of tin do you use. Is there a difference between a loaf and bread tin and is there a better type to buy? Thanking you in advance. Just Us, a loaf tin is the same as a bread tin. Just buy a good quality, non stick tin. Wash it when you buy it, then don't wash it after every use. Just wipe it out. Good luck with your baking. Thank you Rhonda. I have a cheap loaf tin so will definitely invest in a better quality one. Looking forward to trying out your spelt/rye loaf as we use rye for the children's bread and Homemade is so much better! I'm excited to try!